EID festival 2016 is coming very soon and Telenor has announced such remarkable offer in this EID for its valued customers of Pakistan. Telenor has announced good news there are no feature will DE-activate in this EID 2016. Yes now all the cellular operators who are connected with this network can easily use any package of Telenor with correctly because it is providing facility all three Eid days for using various packages of this network. In this year Eid 2016 there are no other telecommunications are providing same service for its customers till yet. Telenor is only one telecommunication network of Pakistan who has officially introduced this offer in this EID for its valued connection users of Pakistan. This network always brings packages as per its customer’s wishes and at this time it has announced such helpful announcement for its consumers of Pakistan. In earlier years we have already seen all packages had DE-activated in Eid festival and customer make calls for EID wishes his/her friends and relatives with expensive charges. From now you just need to get SIM connection of this network and make non-stop phone calls for wishes Eid anywhere in Pakistan by using different packages of Telenor. 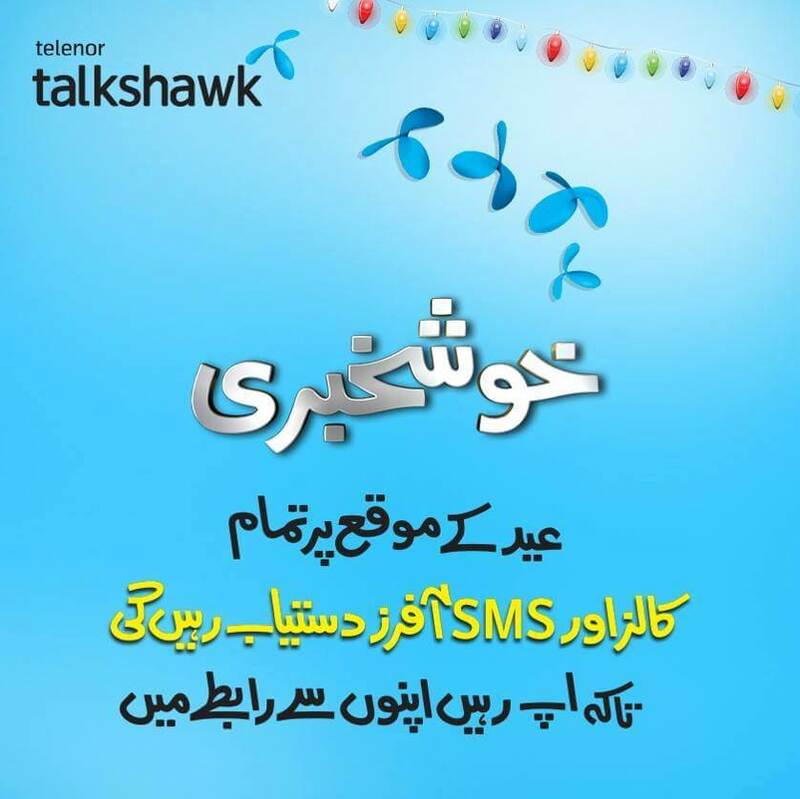 All the post and prepaid subscribers are eligible for using this announcement and all packages will be activated for Talkshawk and Djuice subscribers of this network.This telecommunication really do carry out of customer’s feed backs in last earlier years it has received countless feed backs for don’t DE-activate any package in EID festival. Finally it has done worked for its customer’s feed backs and in this year it is not DE-activating any offer for using different option. Customers can make call anywhere in Pakistan or International countries by using packages of this network. It also provides same facility for various SMS and internet packages of this network. 3G packages of Telenor will also activate in all three days of EID. This announcement is for all across of Pakistan and all the cellular operators who are connected with this network can avail this facility all three days of Eid-UL-Fitr. This announcement is really appreciable because there are many cellular operators communicate and send wishes in Eid through phone calls and they also need cheap calling packages for making unlimited phone calls for its friends and relatives in this occasion. Now you just need to choose favorite package of this network and avail various features of this telecommunication with reasonable charges. Telenor is giving platform for keep in touch and share your feelings with your friends or relatives in this EID by using regular offers of this network. Click here for getting details of various Telenor packages.